It is one of the world's most architecturally beautiful urban sites. 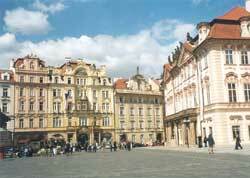 It is the heart of Old Town, which is the heart of Prague, the capital of the Czech Republic. The square is lined with period piece Gothic, Renaissance and Baroque buildings (see photo). The famous outdoor Astronomical Clock displays, besides the time, the astrological positions of the moon and sun. It dates back to the 15th century. On the hour, the two small window doors above the clock's zodiac face open to exhibit the parading statues of the Twelve Apostles. Tourists unfailingly assemble below, patiently waiting for the hourly show to begin. Narrow, winding side streets branch out from the square in a pattern laid out in medieval times. Most are lined with old, short-storied buildings that take you back in time. Some buildings have restaurants and shops. One area is named the Old Jewish Quarter. The foremost attraction of this former ghetto is the cemetery. Its tightly packed old tombstones lean in all directions.